A wise man (well, my friend Dan) once said that it takes a special kind of director to land his movie on the covers of the snooty French art film digest Cahiers du Cinéma and the American horror bible Fangoria in the same month. Guillermo del Toro achieved this seemingly impossible feat with his masterpiece Pan’s Labyrinth, and those dual covers are an apt metaphor for a man who seems equally adept at – and as interested in making – Oscar-nominated allegories about war and big budget Rick Baker creature features. 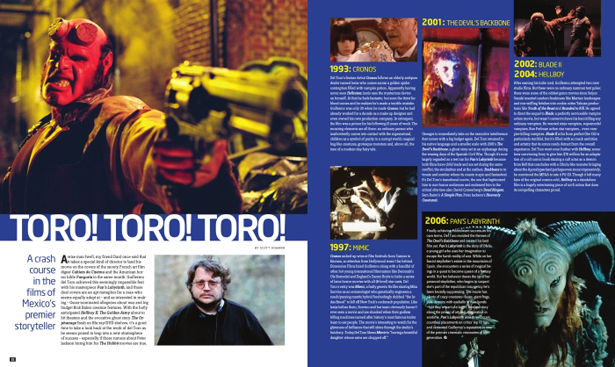 With the hotly anticipated Hellboy II: The Golden Army about to hit theaters and the evocative ghost story The Orphanage fresh on DVD shelves, it’s a good time to take a look back at the work of del Toro as he seems poised to leap into a new stratosphere of success – especially if those rumors about Peter Jackson hiring him for The Hobbit movies are true. Del Toro’s feature debut Cronos follows an elderly antiques dealer named Jesús who comes across a golden spider contraption filled with vampire potion. Apparently having never seen Hellraiser, Jesús uses the mysterious device on himself. At first he feels fantastic, but soon the thirst for blood comes and he realizes he’s made a terrible mistake. Guillermo was only 30 when he made Cronos, but he had already worked for a decade as a make-up designer and even owned his own production company. In retrospect, the film was a primer for his following 15 years of work. The recurring elements are all there: an ordinary person who inadvertently comes into contact with the supernatural, children as a symbol of purity in a corrupt world, magical bug-like creatures, grotesque monsters and, above all, the tone of a modern day fairy tale. Uneager to immediately take on the executive interference that comes with a big budget again, Del Toro returned to his native language and a smaller scale with 2001’s The Devil’s Backbone, a ghost story set in an orphanage during the waning days of the Spanish Civil War. Though it’s now largely regarded as a test run for Pan’s Labyrinth because both films have child leads and are set during the same conflict, the similarities end at the surface; Backbone is intimate and somber where its cousin is epic and fantastical. It’s Del Toro’s transitional movie, the one that legitimized him to non-horror audiences and endeared him to the critical elite (see also: David Cronenberg’s Dead Ringers, Sam Raimi’s A Simple Plan, Peter Jackson’s Heavenly Creatures). After earning his indie cred, Guillermo attempted two new studio films. But these were no ordinary summer tentpoles, these were some of the oddest genre movies since Seijun Suzuki inserted random freakiness like Martian landscapes and rice-sniffing fetishes into cookie cutter Yakuza productions like Youth of the Beast and Branded to Kill. He agreed to direct the sequel to Blade, a perfectly serviceable vampire action movie, but wasn’t content to have his hero killing any ordinary vampires. He wanted ninja vampires, supermodel vampires, Ron Perlman action star vampires… even vampire-killing vampires. Blade II is far from perfect (the CGI is particularly terrible), but it’s filled with so much ambition and artistry that its errors rarely detract from the overall experience. Del Toro went even further with Hellboy, somehow convincing Sony to give him $70 million for an adaptation of a cult comic book starring a cult actor as a demon from Hell that concludes with a Cthulu-like monster bringing about the Apocalypse (and perhaps even more impressively convinced the MPAA to rate it PG-13). Though it left many fans of the original comics cold, Hellboy as a standalone film is a hugely entertaining piece of sci-fi action that does its compelling characters proud. Finally achieving mainstream success on his own terms, Del Toro revisited the themes of The Devil’s Backbone and created his best film yet. Pan’s Labyrinth is the story of Ofelia, a young girl who uses her imagination to escape the harsh reality of war. While on her fascist stepfather’s estate in the mountains of Spain, she encounters a series of magical beings in a quest to become queen of a fantasy world. But her behavior draws the ire of her paranoid stepfather, who begins to suspect she’s part of the republican insurgency he’s been brutally suppressing. The movie has plenty of crazy creatures – fauns, giant frogs, pale demons with eyeballs in their hands – but they’re part of a larger, timeless story about the power of art and imagination in wartime. Pan’s Labyrinth won three Oscars, countless placements on critics’ top 10 lists, and cemented Guillermo’s reputation as one of the premier cinematic visionaries of his generation.